For those that don’t know me well (or just haven’t read my blog intro), I’m originally from a small town in northern Illinois called Sycamore. It’s just about a two-hour drive east on 88, and I’ve spent most of my life there. In March, my family made the move to St. Louis. I recently had a taste of winter in St. Louis over break, which was quite the experience. After seeing what a St. Louis winter is like, I couldn’t help but compare the winters of northern Illinois and St. Louis, kind of like a competition to see which one is better. The answer might surprise you! I’m sure plenty of readers are from this area, so you know how it goes. There’s typically one HUGE snow storm every winter which shuts down school for a day or two, no big deal. We’re used to digging out cars parked on the street, and we can shovel a driveway so fast that it should go on our resumes. The only thing that sets us back at times is the crippling cold temperatures. “Polar Vortex” sounds like it should be a Six Flags ride, not a description of the weather. 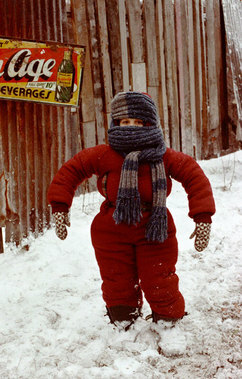 When we do venture out, however, we’re used to bundling up until we resemble Randy Parker from A Christmas Story. Overall, winter in Northern Illinois is something we’re capable of handling. Winter comes every year, life goes on. But, that’s not the case in St. Louis. When I got home for break, I only needed a sweatshirt to keep me warm. For a few days, I could go get the mail in a tshirt. What was this sorcery that is 55 degrees in December?! I thought I had died and went to heaven. “Parka” and “insulated mittens” seemed to float right out of my vocabulary. Apparently, it was the most snow that St. Louis had gotten in quite a few years. When all was said and done, there were 9-12 inches of snow on the ground. I knew there would be a snow day on Monday for the local kids. If they canceled school for snow like that in the 815, they would cancel it for these kids. And they did, as expected. Some schools canceled class for the entire week. My sister was out of school for four days because of “winter weather.” The city pretty much shut down. Cabin fever ensued. The street that I live on was never plowed, and some streets were only plowed at the beginning of the snowfall. I realize that St. Louis isn’t used to that much snow, but really? It’s like the plow truck drivers saw the snow totals on the news and said “Wow, what a lovely shade of hot pink that is covering the local area.” Little do you know, lovely plow truck driver, hot pink = lots of snow. It’s time to choose a winner! Despite the freezing cold temperatures and huge snowfall totals, the Northern Illinois Winter is my personal winner. They know how to do winter and don’t let a few inches (or feet) of snow get them down. Let’s be real, though. I’d much rather be at the beach!